The new Zeiss binocular harness ensures that your binoculars are always exactly where you need them: around your neck and on your chest. Its special features include easy, practical fixation of the binoculars and outstanding wearing comfort. 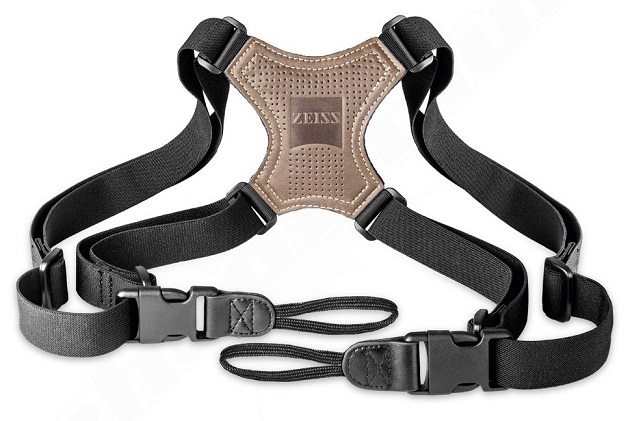 Compared to simple carrying straps, the new strap from Zeiss allows you to carry your binoculars in total comfort. It is made of high-quality materials and feels pleasant on your skin. The high-quality workmanship prevents neck strain and distributes the weight of the binoculars over your upper body. The binoculars remain steady and do not swing in various directions when you are moving about. The strap length can be adjusted to meet the need of a wide range of applications. The binoculars are connected by feeding a strap through the brace eyelet. This type of connection is particularly quiet and prevents damage to the binoculars. Quick-release fasteners allow you to attach and detach the carrying strap extremely fast.